"The lecturers were absolutely brilliant – all of them." Nathanael, 24, got a love for gardening and landscaping from both of his green-fingered grandfathers. He decided to take Horticulture at Broomfield Hall. The Level 2 course – “it was really good” – gave him skills and knowledge in areas such as plant nursery, landscaping and plant stock. He said Level 3 furthered his skills and gave him the option of going on to university. 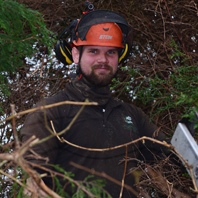 But during college, Nathanael had worked part-time with the landscaping and tree surgery business, MW Haspel. When he was offered a full-time job, he decided to go down that route, and also gained his qualifications for tree surgery. After a period with another business, Nathanael accepted the opportunity to return and run and manage MW Haspel’s tree surgery operation. Derby College had given him the skills and knowledge to set him on the road, with Level 3 giving him “a really helpful” insight into business management. His dad also managed his own business, fitting security cameras and lights, which provided useful background knowledge. Nathanael said: “When I started at college I kind of thought of the idea of setting up on my own but didn’t really think I would run a business. “The lecturers gave me a little push and a bit of advice. Derby College was very important to me. In future he said he may have the opportunity to take on the business entirely. And the best part of the job? The “awesome” views from the top of the tallest trees. Find out about studying Horticultural Studies at Derby College.